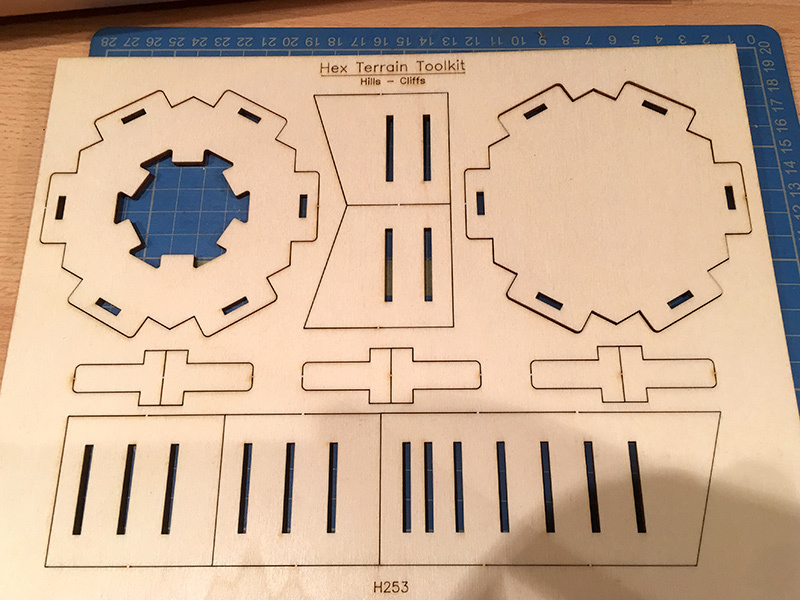 The Hex Terrain Toolkit arrived this week. I signed up for this project six months or so ago after seeing it mentioned on the The Miniatures page forums. 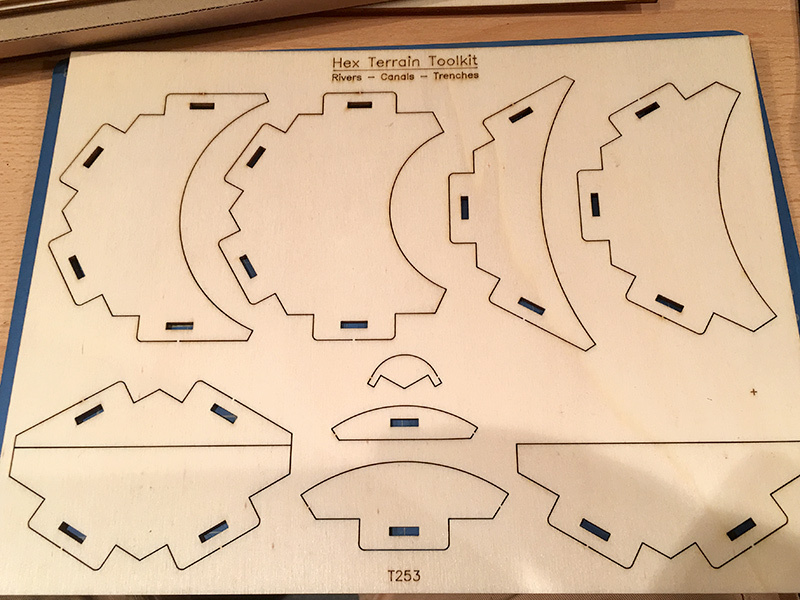 It was a Kickstarter project looking to fund the making of a set of templates to make hex terrain. I signed up for the top level of investments meaning I got the whole kit to make all the different types of hexes on offer. I promised around £60 if the project got fully funded. And it did, to the tune of over £37,000. 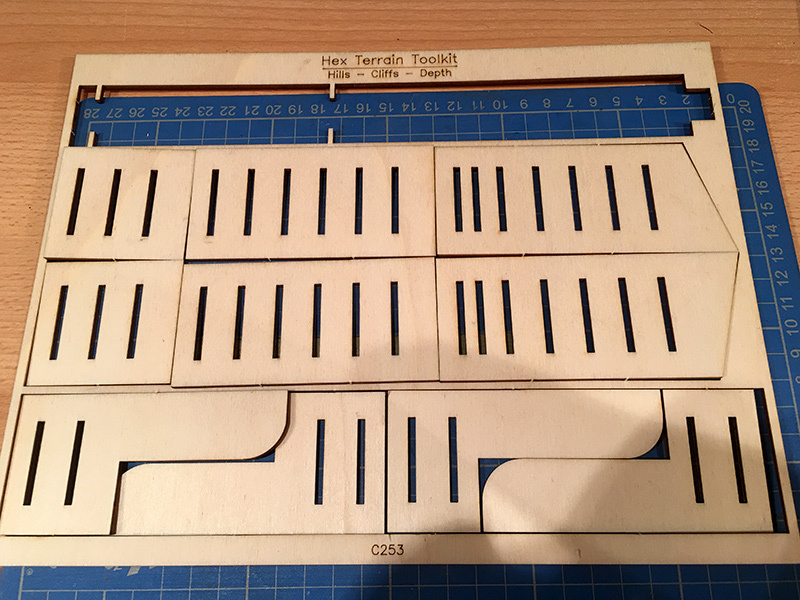 The kit arrived in the post this week and consisted of 4 sheets of plywood all laser cut into various templates. Each sheet allows you to add on more choices for different hexes. 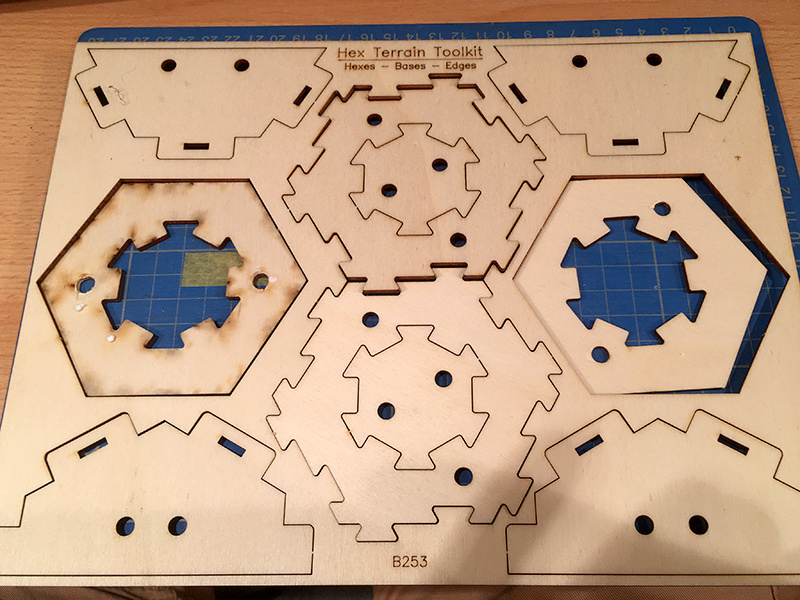 I ordered some sheets of underfloor heating insulation foam, which is like polystyrene but a bit denser and it has been sitting in the play room awaiting the arrival of the Hex Terrain kit and the hot wire cutter which I bought a few days ago. The kit was initially supposed to be made from MDF but the designer changed to plywood for some technical reasons which I can’t now recall. The various bits fit together and are used to cut around so the foamboard is shaped accordingly. Each piece has slots and/or lugs to allow them to slot together and they are very tight, and I mean very. The video which goes with the kit says you have to sand the edges of the lugs down and fit and refit them into the slots until they go in more easily. the trouble is that the plywood is so unforgiving that it snaps quite easily. In fitting the bits together, and trying to be careful, I still managed to snap four templates. I’ve had to glue them together with PVA using splints made from the template surrounds. A couple of the templates also have littler splits of small parts that have split off from the body of the template piece.It remains to be seen how hardy the kits are when they are being used in anger. So I’ve made up my first few hexes, in fact I’ve been making hexes like they are going out of fashion. I’ve only made some of the basic hexes at the moment, flat hexes of two different thicknesses and some road/river ages. It’s going to take a while to make enough terrain to cover a six by four foot table….